You'll be £15.99 closer to your next £10.00 credit when you purchase The Dauntless in Battle. What's this? The Douglas SBD Dauntless, a monoplane dive-bomber designed by Ed Heinemann for the United States Navy and United States Marine Corps, arrived in service in the months just preceding America’s entry into World War II. The first such aircraft were being shipped out to the USMC units just as the Japanese Task Force arrived in position to launch their attack on Pearl Harbor, while those Dauntless embarked aboard the American aircraft carriers of the Pacific Fleet became among the very first casualties of that surprise attack. Very quickly the Dauntless established herself as a highly accurate naval bomber at sea. However, when the Army Air Force adopted the type (as the Banshee) they lacked the Navy’s expertise at this method of attack and the hastily-deployed units that tried to stem the tide of enemy victory in the Dutch East Indies were overwhelmed and took heavy losses, which gave the USAAC the excuse to abandon the type. The US Navy and Marine flyers fared quite differently. In the early raids on Japanese-held islands - and in 1942 at the naval battles of the Coral Sea and Midway, Eastern Solomons and elsewhere - she proved herself a key and decisive instrument to first halt and then turn the die against Japanese expansion. The SBD (nicknamed ‘Slow But Deadly’) fought ashore the bitter fighting a Guadalcanal and the subsequent Solomon Island campaigns working from both shore and carrier bases. The Royal New Zealand Air Force also formed a squadron with this aircraft that fought at Bougainville with distinction. 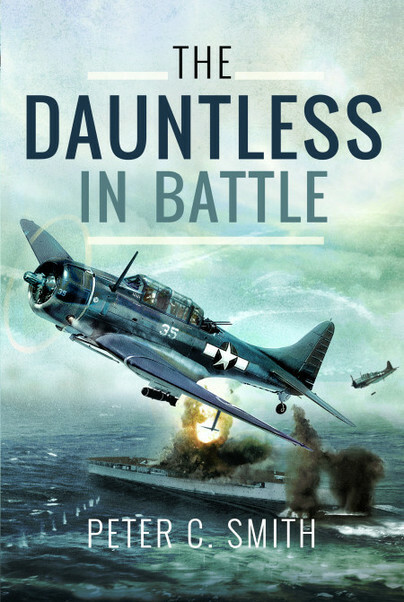 The Dauntless continued to fight a sea until right up to 1944 and then carried on with the Marine Corps to provide the American Army with close air support in their conquest of the Philippines. The Dauntless also served with the French Air Force and Navy in North Africa, Europe and, post-war, in Vietnam. Peter C. Smith is well-known to aviation and maritime history readers. He has written over 67 previously published books. Amongst these are Skua, Detroyer Leader, Into the Minefields and Naval Warfare in the English Channel 1939-1945, all published by Pen & Sword. Peter C. Smith was nominated for the Maritime Foundation’s Mountbatten Maritime Award for Best Literary Contribution for their book : Sailor on the Rocks: Famous Royal Navy Shipwrecks'.